Welcome to CrystalMaker 9: an advanced chemical & materials modelling program, featuring energy minimization, crystal-engineering - combined with full crystallographic model building and visualization. 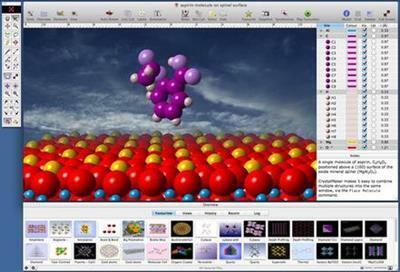 CrystalMaker provides a streamlined workflow that majors on productivity: just drag-and-drop your data files into the program for instant display in spectacular photo-realistic colour. Manipulate structures in real time, with the mouse. Multiple View "bookmarks" and undo levels encourage exploration and discovery - ideal for teaching and research.